Questions have been raised over the past few years about what will happen to the Boxwood Hall property. Residents could have an answer ­– a downtown performing and visual arts center. A committee called Boxwood Arts Theater and Cultural Center sent a press release on Wednesday, Oct. 13 after questions on the future of the property were asked during last Tuesday’s Borough Commission meeting. The committee expressed it is exploring the feasibility of a theater and arts center at 65 N. Haddon Ave. 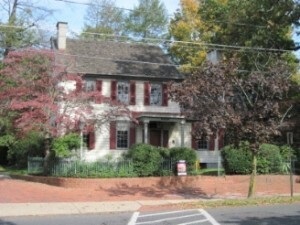 The borough purchased the 18th-century house along with a 20th-century house and 1.4 surrounding acres for $1.8 million in 2014. Boxwood Arts is a committee representing Haddonfield’s arts and community interests. The three main organizations working behind the committee are Haddonfield Plays & Players, the Markeim Arts Center and Dance Haddonfield. The group envisions the heritage-protected building at the front of the property, built by John Estaugh Hopkins in 1799, would become gallery space for the Markeim Arts Center. A 365-seat theater to be built behind the house would be a new performance space for Haddonfield Plays & Players and provide a venue for lecture series and other cultural and musical events. And a multi-purpose space below the theater would include a competition-quality ballroom/dance floor for Dance Haddonfield. “Boxwood Gardens,” the woods at the rear of the property, described as “overflowing with Haddonfield history,” would be preserved and made accessible to the public for cultural and educational purposes. Since the project is still in the conceptual stage, plans and cost estimates are not available to the public. However, Stavetski said Boxwood Arts has been consulting with Arcari + Iovino Architects, the firm that worked with the recent renovation of the library, and an inclusive design consultant, to make sure the center would embrace the needs of those with all abilities. According to the press release, if the vision were to become a reality, it is likely the borough would continue to own the property and that a community-based non-profit corporation would manage it under a long-term lease. Funds for new construction, conservation of the grounds and renovation of Boxwood Hall would be raised from private sources and preservation grants, Stavetski said in the release. “We will offer programming that matches the fabric of the community, and have formed a strategic partnership with an unnamed, well-funded Philly-based arts organization seeking an anchor location in South Jersey. A variety of financing options are being explored, and an active fundraising campaign has been launched and is gaining significant interest and wide support,” Stavetski said. Resident Kim Custer was the resident who asked what was happening with the property on Tuesday night. Mayor Jeff Kasko said there was a group looking to a portion of the property, and Commissioner John Moscatelli further explained it was the theater group. Moscatelli explained at the meeting the subdivision plan for the property is already done. If it is decided that the group is not going to go forward, or if its plan is not approved, the next step would be to subdivide and sell the two parcels, and the woods in the back will be preserved as a park. “The size (of the park) does not change. The difference will be, if there is a facility there that draws people, you’ll have more traffic into that park, and I think a lot more people will use it than if you got a residential and commercial lot for Boxwood,” Moscatelli said. Resident Brian Kelly, founder of the Haddonfield United group, asked that if Boxwood Arts were to go forward with the plans, that they include something about funding. “Is there anyway they can put something (funding) into the park? Because they have a responsibility to do that,” Kelly said. Stavetski said that is something that would need to be determined, but the group is willing to work with the community on how best to preserve it. “The arts can work together with the preservationist to come up with something that works for everybody,” Stavetski said.